In the last two weeks, since the Norwegian Epic’s inaugural voyages, Norwegian Cruise Line’s newest and most spectacular ship has set new records for booking levels. The amount of bookings made for cruises onboard the Epic in the week ending July 10th were the highest seen this year. 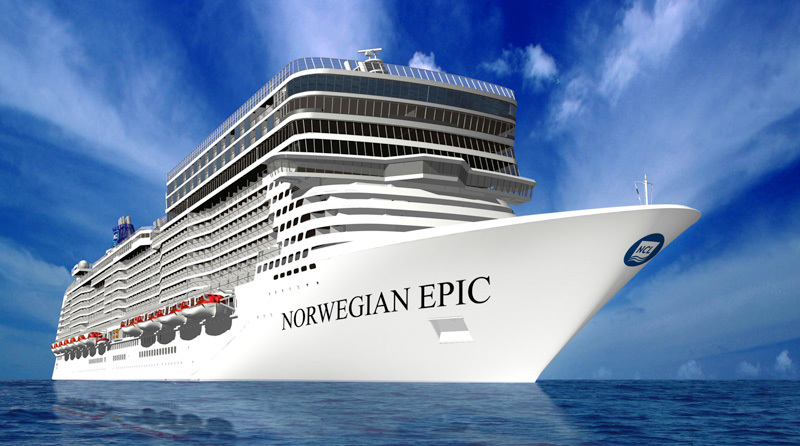 There has been mass media attention given to the latest ship in Norwegian Cruise Line‘s fleet, which is likely to be largely responsible for this influx of travellers looking forward to cruising aboard the Epic. From the spa, to the ice bar, the media have been following this ship closely and with such unique onboard facilities, it is no wonder that cruisers all over the world want to experience the Epic. The ship has received extremely positive reviews from both travel agents, and passangers who have travelled onboard the ship for it’s first cruise. It is likely that as more reviews come in, and talk about the ship increases further, more booking records will be made as the Epic becomes the ship of choice for seasoned cruise lovers. The Epic can hold up to 4,100 passengers as it has been billed as the largest entertainment venue on water, offering various forms of activity and entertaintment that just aren’t available on other ships. The ship was also the venue for Macy’s 4th July Fireworks show this year, which was broadcast on television all over America. The program was watched by millions, which no doubt raised the profile of the Norwegian Epic even further. The 153,000 gross ton ship is currently sailing on a cruise around the Eastern Caribbean and will be sailing alternating 7 day cruises to Eastern and Western Caribbean destinations.